On November 4, 2010, the presidents of the NARHA Board of Trustees and the EFMHA Board of Directors signed a proclamation fully integrating EFMHA into the association. For questions about the NARHA/EFMHA integration, please read the Frequently Asked Questions document located on the Future Trends page of the NARHA website. It is with great enthusiasm that the NARHA Equine Specialist Certification Subcommittee and the NARHA staff announce the Equine Specialist for Mental Health and Learning Certification. Equine-Facilitated Learning and Equine-Facilitated Psychotherapy are rapidly growing fields, and this certification is meant to improve the experience for all involved. A lot of hard work has been done by the Equine Specialist Certification Subcommittee to respond to the need of the growing mental health field within NARHA. The Equine Specialist for Mental Health and Learning Certification is meant to certify an individual as the horse handler in any un-mounted mental health or learning session. 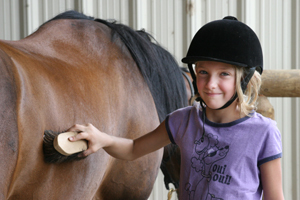 If the session is mounted, a NARHA Certified Instructor will continue to supervise the activity. The pilot for the first horsemanship skills test will be held in Florida in February in conjunction with the NARHA Equine Specialist workshop, both of which are required to gain certification. If you are interested in attending the pilot, please contact the NARHA office or click here to download the application. Many of our NARHA members are already preparing for their new certification and have long awaited the release of this certification. A big thank you to all for your patience and excitement! Contact Tara McChesney, (800) 369-RIDE (7433) with questions regarding the Equine Specialist for Mental Health and Learning Certification or the workshop. Donations Make Great Gifts This Holiday Season! 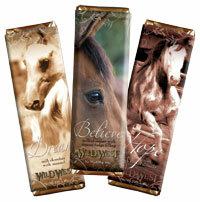 Darley Newman, host of PBS's "Equitrekking," recently posted her article on holiday gift ideas for horse lovers. Her #1 gift idea is to donate to a worthy cause -- and NARHA was mentioned as being close to her heart. We think it's a great idea! Click here if you would like to donate to NARHA this holiday season. "Equitrekking" is the Emmy Award-winning lifestyle television series that takes viewers on global travel adventures to experience culture, cuisine, history and adventure. "Equitrekking" broadcasts to 94 percent of the U.S. on PBS, on international networks in over 65 countries and on CREATE, Public Television's nationwide lifestyle channel. 2010 Conference "by far the best"
Dita Keith, our NARHAbars vendor, had this to say about the 2010 NARHA National Conference and Annual Meeting. "Thanks again for your work in putting on an incredible national conference. It was a fantastic event! It was really well done and I thought all the presentations I attended were incredibly well-delivered. The array of topics and experiences (including the quilt making/crafting R&R) were compelling, creative, educational and really inspiring. I had a great time as both an attendee and vendor. Thank you and your fellow staff for making The NARHAbar Program experience easy, effective and welcoming for a vending newbie. I have been to 3 national conferences and this was, by far, the best." Click here for information on NARHAbars and how you can raise funds for your center through this exciting program. Interested in being an exhibitor or vendor at the 2011 NARHA National Conference in Lexington, KY? Contact Barbarba Yost, (800) 369-RIDE, ext. 109, to learn more. Equine Specialist Workshops: It is very exciting for NARHA to see so many individuals interested in the Equine Specialist workshops. Please join us in celebrating the release of the Equine Specialist for Mental Health and Learning certification. We would like to accommodate individuals eager to be certified by holding more Equine Specialist workshops and practical horsemanship skills tests. Please help us get workshops scheduled for 2011! All workshops will now be offered with the new Equine Specialist practical horsemanship skills test, if the host site chooses. Host sites can also host the practical horsemanship skills test without a workshop if they wish, a requirement for certification. Intent to Host: Click here to download the intent to host forms for all NARHA events. It is our hope that 2011 will be full of exciting events! Please read through our intent to host packets for details concerning hosting an event. We would love to add more driving workshops, vaulting workshops and certifications to our 2011 calendar so please consider hosting an event! Contact Kelly Sullivan, (800) 369-RIDE (7433) with any questions regarding the 2011 workshops or hosting process. Thank you! Click here to renew online. NOTE: The center's primary contact or executive director must be logged in to his or her personal account in order to renew online. Of course if you prefer to send in a hard copy renewal, that is still an option. Download and complete the center renewal booklet and renewal invoice from the NARHA website, and mail it in. Click here to download the center renewal booklet. If you won a silent auction item and did not pick it up, it is still at the NARHA office. If you were contacted about your item and would still like it, please contact Cher Smith, (800) 369-7433, ext. 123, to pay for your item. Any unclaimed items will be auctioned off to NARHA staff on December 15. Nikki Caine, an undergraduate student in equestrian sports science (equestrian psychology) at Nottingham Trent University, is conducting a survey on the types of horses that are used in different equine-assisted therapies as a part of her dissertation. Please click here to complete this survey. The more survey results obtained, the more credible the research. Her study will be written positively about equine-assisted therapy and will contain a literature review describing many different types of therapies and their benefits. The aim of this study is to see if there is a significant difference between the types of horses that are used in different therapies. All participants will be recognized for their contribution in the final document if they give permission to do so. No data will be specifically linked to individual centers, thus the information given will remain anonymous. Results will be emailed to anyone who contributes to the study. For further information, please contact Nikki Caine or her supervisor Dr. Carol Hall. Please visit the NARHA calendar for a list of registered on-site workshops and certifications. Please note the list is not complete, there will be more NARHA Registered OSWC events added.